Sold by : Strand - must take last 2. 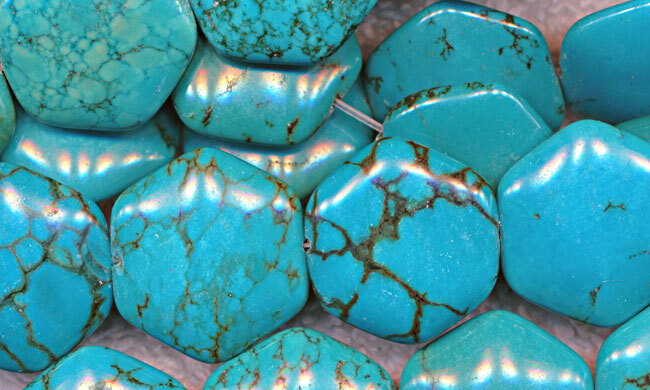 Stabilization is used to make turquoise strong enough to use in jewelry and beads since turquoise is by nature a soft stone. It also sets the color since natural turquoise will turn colors over time from skin oils and environmental elements. Only 10% or less of all turquoise mined is gemstone quality which means it is strong enough to use as jewelry components without stabilization. Stabilization provides turquoise beads that are reasonably priced. All Strands are Industry-standard in Length -- Average 15.5 to 16". Due to the nature of gemstones and your computer's graphics card and its settings, shades may vary. All piece-counts are approximate; size information is listed as outer dimensions and is approximate.